"After years of adjustments I have found a recipe for all to enjoy. Previous ones were either too hot or too mild, this one even was to the liking of my finance who hates chili." Heat oil in a large pot over medium heat; cook and stir onion, bell pepper, Anaheim pepper, jalapeno peppers, and garlic in the hot oil until softened. Meanwhile, heat a large skillet over medium-high heat. Cook and stir beef in the hot skillet until browned and crumbly, 5 to 7 minutes; add Worcestershire sauce and garlic powder. Crumble bouillon cubes over beef and add beer. Continue to cook , scraping any browned bits from the bottom of the skillet, until liquid is hot, about 3 minutes. Stir beef mixture into pepper mixture. Stir crushed tomatoes, diced tomatoes, tomato paste, and wine to the beef mixture. Season with chili powder, 2 tablespoons cumin, brown sugar, pepper sauce, basil, paprika, salt, oregano, and black pepper. Bring to a boil and reduce heat to medium-low. Cover and simmer until meat and vegetables are very tender and flavors have developed in the chili, about 90 minutes, stirring occasionally. Mix kidney beans into beef and vegetables. Continue to simmer until beans are hot, about 30 minutes more. Blend sour cream, cilantro, and remaining 1/2 teaspoon cumin in a food processor until smooth. Serve sour cream mixture with chili. 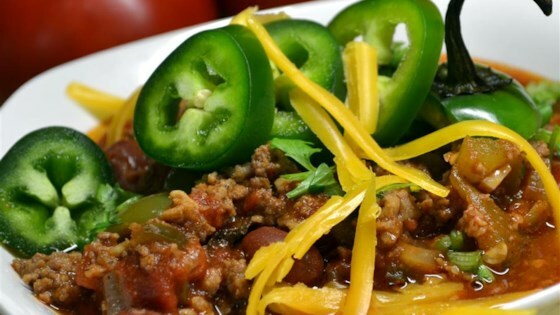 Perhaps the best chili recipe out there. The tomato paste was "way to much", it over powers the other spices. My advice is to start with about 4,OZ and add to it if not delete it altogether. My new go-to chili recipe. It is perfect. I won the chili cook off at work with this recipe. It was very good.I used a dortmunder gold beer from Cleveland with mine.I also used great northern beans because I'm not a fan of kidney beans.